I read this article and found it very interesting, thought it might be something for you. 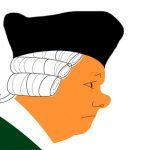 The article is called How the Invisible Hand Was Corrupted by Laissez-Faire Economics and is located at http://evonomics.com/how-the-invisible-hand-was-corrupted-by-laissez-faire-economics/. As I learned my economics and further explored the influence of the Invisible Hand, the power of ideas became clearer to me. Economic ideas have had enormous influence on economic conditions—and vice versa. 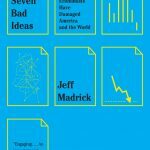 Over the past thirty-five years, the ideas at the center of orthodox economics, did damage and laid the groundwork for the financial crisis of 2008 and the Great Recession that followed. The Invisible Hand, though alluring, is highly ambiguous—it does good and harm. A beautiful idea can be described as one that explains a lot with a little. Such ideas are often simpler than previous explanations of a phenomenon. But they can be siren songs, and throughout history many such ideas have been found to be wrong: the Aristotelian belief that heavy items fall fastest to earth; the once-dominant idea that the veins and arteries are separate circulatory systems; the notion, which seemed undeniable to educated people at one time, that the earth is the center of the universe. The Copernican idea that the sun, not the earth, is the center of the solar system is a classic example of the best kind of beautiful idea. It is elegant and simple and, most important, ultimately correct. But time was still needed to break the shackles of the older, mistaken beautiful ideas. Once accepted, such ideas are hard to shed. They become part of us and color how we think. Physical observation alone did not pave the way to the Copernican idea, which took some time to gain acceptance. There were also cultural and philosophical changes that opened paths to such thinking. Our sense of our uniqueness as a species may have already been diminishing culturally and intellectually before Copernicus’s astronomical theory took shape, making it possible to accept the radical notion that the earth was not the center of it all. History is more a circle than a line—a feedback loop rather than simple cause and effect. I’d argue that economists too often overlook that. Honest economists readily admit their oversimplifications; confused economists take them more literally. The beautiful idea of the Invisible Hand enraptured economists as well as many political thinkers for more than two centuries. But it is not an idea with the power of, say, the Copernican discovery. It is more a loose metaphor for the way markets may work than an ironclad law. The Invisible Hand is believed by economists to demonstrate that markets where goods and services are freely exchanged will result in the greatest benefit to buyers and sellers alike, and as noted direct investment where it is most useful, enhancing the rate at which the economy can grow. All of this takes place without any outside government intervention. Orthodox economists have made the Invisible Hand the basic foundation of their work. They grudgingly agree that sometimes government intrusion in the market is necessary. Usually, though, government efforts are seen as harmful. Most extraordinary, many economists claim that just as the market for cornflakes is self-adjusting, so, too, is an entire economy. Supply and demand automatically adjust to a “general equilibrium” that satisfies as many people as possible. In a recession, prices, wages, and interest rates will fall. More goods will be demanded, and production will rise again. Excessively rapid growth will result in higher prices, which dampen demand and will perhaps create a recession that lasts until the economy readjusts. A recession will only be temporary, as will excessive growth. Unlike the Copernican revolution, however, the Invisible Hand is an assumption, not a scientifically based law. Its obvious limitations have not prevented its supreme influence. The alllure of the Invisible Hand is its elegance. The profound weakness is that it is not nearly as complete a model of markets as many economists insist it is. Its underlying assumptions—that people have material preferences that don’t change, that they are rational decision makers, and that they have all the price and product information they need—are extreme. The Invisible Hand is thus a limited proposition, elegant but impure. It especially draws theorists toward the laissez-faire model of governing, which holds that government intervention should be minimized. Indeed, the free market, not government, is accepted as the dominant organizing mechanism of society. Smith used the term “Invisible Hand” just once in The Wealth of Nations and only once in his earlier work, The Theory of Moral Sentiments. The historian Emma Rothschild, in her book on Smith and the Marquis de Condorcet, two towering Enlightenment scholars, argues that Smith was more ironic than serious about the Invisible Hand, always assuming an active role for government in creating the rules and regulations of society and fully conscious of the need for compassion and community, which he outlined rather beautifully in The Theory of Moral Sentiments. But Smith took the Invisible Hand very seriously, I’d argue, even as he assumed a large role for government. He was a complex thinker, breaking new ground in many areas, and too much time has been spent trying to make his abundant ideas consistent with one another. He could believe in limiting government in some ways but expanding it in others. Even though he explicitly mentioned the Invisible Hand only once in The Wealth of Nations, elsewhere in his masterpiece he addressed it at length. Emma Rothschild, appropriately skeptical of the Invisible Hand, emphasizes its “loveliness.” To many, she observes, it is “aesthetically delightful.” Rothschild notes that for the Nobel laureate Kenneth Arrow and his highly regarded coauthor Frank Hahn the Invisible Hand was “poetic.” Arrow and Hahn wrote that it is “surely the most important contribution of economic thought.” Another Nobel laureate, James Tobin, called it “one of the great ideas of history and one of the most influential.” The American conservative philosopher Robert Nozick is impressed by how it finds an “overall pattern or design” out of a seeming jumble of decisions. Its simple elegance, as I’ve said, is part of the reason for its influence. Rebuttals of it tend to be intricate, but this does not make them wrong. A rare readable rebuttal of Smith’s moral contentions can be found in Adam’s Fallacy, a short book by the nonmainstream economist Duncan Foley. 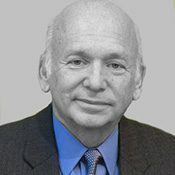 Others have built economic systems that give less credibility to the central proposition that economies are a collection of markets driven by the Invisible Hand and more to the influence of tradition, culture, power, war, and the development of the law, the banking system, and other institutions. Economic growth cannot, it turns out, be explained by the simple mechanism of the Invisible Hand, however key a role it played. These other less traditionally economic factors matter enormously. Foley is part of this tradition, as is the similarly nonmainstream Lance Taylor, whose Maynard’s Revenge is a variation on the failures of Smith’s theory. The Invisible Hand, however, overwhelmingly trumps all these insurrectionary ideas in the practice of economics today. With the stakes so high, how could I not have wanted to understand the way economies create wealth? How could I not have embraced the Invisible Hand? Was there some set of conditions and choices that underlay prosperity, a set that could be maintained and enhanced? In short, was there a universal key to economic growth? Political decisions, the tides of history, scientific breakthroughs, the spread of literacy, the rise of rapid transportation—all these and more affect growth. But my college textbooks, even when they included sections on Keynesian government stimulus, by and large agreed that prosperity is mostly a consequence of the Invisible Hand—that is, a free market. Adam Smith may not have been an economist per se, but to my mind he was an economic historian of his times. Better said, he was an economic sociologist. He wanted to understand the causes of the prosperity that existed in Scotland and the rest of Britain. History’s leading theoretical innovators were trying to make sense of what they saw as surprising and robust economic advances since the 1700s. They noted how wealthy many individuals were becoming; how cities were growing; how agriculture was feeding more people; how new water mills and factories were producing goods more cheaply; how many new businesses were being started; how canals and, over time, railway lines were proliferating; and how technology was advancing rapidly. Neither they nor their greatest successors created economic edifices out of theory; instead, they created theory out of the concrete edifices they observed. Unlike, say, Newton’s or Einstein’s theories, which offered predictions based on immutable laws of nature (within defined limits, granted), economic theories did not predict the Industrial Revolution or the fabulous wealth of today’s rich nations. John Maynard Keynes was a brilliant but mostly conventional economist until the devastating Great Depression; when the facts on the ground changed, he said, he had to change his ideas. Smith started with the aforementioned pin factory, a classic example of rising productivity, both simple and highly illustrative. Smith may have called the manufacturing of pins “trifling,” but the availability of cheap pins was important to the burgeoning textile industry. Smith explained that one man could make one pin a day, perhaps twenty. But when manufacturers learned to divide and specialize the work, productivity exploded. Smith reported that there were up to eighteen separate operations—“ one man draws out the wire, another straights it, a third cuts it, a fourth points it”—and by dividing the labor, twenty men with specialized skills could now make an astonishing forty-eight thousand pins in a day. This huge multiplication of output was achieved even as the cost of labor remained low. Here, in a nutshell, was the miracle of modern wealth. But it was the Invisible Hand that directed business to make such investments as demand created opportunity; it was the guidance system, so to speak. This primitive example of growing productivity is crystal clear. Smith went on to show how it characterized industry after industry. More than a century later, the division of labor became the basis of mass production, which made use of elaborate machines that, by and large, worked on the same principle of breaking tasks down to their simplest level. Henry Ford took this to the extreme, paring down the multiple tasks involved in building a car to a degree that no one had imagined possible. When Ford started out, a car with an internal combustion engine typically cost around $5,000. He eventually got the price down to a few hundred dollars, having figured out a way to make so many more cars with little change in labor time or costs. There have been countless examples in industrial history of this reduction in price. By the end of the 1920s, about three-fifths of American families had a car—compared to a little over one-fifth a decade earlier—and a huge number owned washing machines, radios, and telephones. The increase in television ownership in the 1950s was even more explosive—and even with TVs being relatively more expensive, adjusted for inflation, than the computer would later be. But since the 1980s, the price of a personal computer has dropped substantially, and now about three-quarters of Americans own one. Division of labor was the central principle, but other factors were exploited to increase productivity. New sources of power made a significant difference by reducing labor time: wind and water at first, well before Smith’s day, then coal, oil, and, finally, the generators that produced the electricity (and, to a much lesser degree, nuclear fission) that powered the increasingly complex machines that produced more and more goods faster and faster with less and less labor. Another major factor was the rising speed of the transportation of raw materials, parts, and finished goods to producers and markets—first over the waterways, then by train, and soon on trucks and huge oceangoing vessels. The steam engine was key to these developments, but so were navigational techniques. Transportation costs were sharply reduced, which also radically enhanced the mobility of labor. Soon communication became faster, further boosting productivity. The telegraph was critical to American economic development in the mid-1800s, as was the telephone by the end of the century. Lower costs of parts made it possible to produce countless newly invented products over the decades. The size of the market was every bit as critical as output—and maybe more so—and has usually been overlooked by contemporary economists. The division of labor and other productivity improvements could only be made if the market was large enough. Smith knew this, giving the third chapter of The Wealth of Nations the title “That the Division of Labor Is Limited by the Extent of the Market.” What good would it be to make forty-eight thousand pins rather than two hundred if there was no need for those pins, even if the price dropped drastically? Markets had to expand beyond the village to the region, the nation, and the world. This was another reason that more efficient and low-cost transportation was so necessary to the advance of productivity. The process that created the incentives to increase productivity and guide production and prices was itself driven by self-interest, Smith argued. He observed that it is merely a human “propensity” to want to barter and that the way to get what one wants is by giving others what they want. The fact that Smith used the term “Invisible Hand” only once in The Wealth of Nations has, as noted, misled some scholars into thinking that he did not really care about or even fully believe in it. Yet the chapter in which he described it without explicitly mentioning it—“ Of the Natural and Market Price of Commodities”—is the most important in the book. First of all, Smith assumed there was a “natural” price for every good, one ambiguously based on the long-term costs of producing the product. “When the quantity of any commodity which is brought to market falls short of the effectual demand,” he wrote, “a competition will immediately begin [among those who want to buy it], and the market price will rise.” In other words, as demand increases, the price rises until it reaches the point at which the entire quantity produced is consumed. If supply increases, the opposite occurs. As he wrote, “When the quantity brought to market exceeds the effectual demand . . . some part must be sold to those who are [only] willing to pay less, and the low price which they give for it must reduce the price of the whole.” Thus, more people can own the product at the lower price. Supply and demand shift to strike a balance at a specific price, which is called the equilibrium point. If there is too much of a commodity or, similarly, too much labor or land, the employer will cut jobs or wages or the landowner will reduce the price or amount of salable land until the wage or the price reaches its so-called natural level. If there is greater demand, the employer will hire more workers or the landowner will prepare more land for use. Natural price and effectual demand are ambiguous ideas, but they were key, if unexplained, assumptions for Smith. Later economists would spend a lot of time trying to make these ideas more explicit. But they essentially accepted the assumptions without ever to this day devising a complete explanation of how price and demand are determined. Price always gravitates to its natural level, Smith said, so that demand is fully met and the resources of a nation are fully used. Economists assume as much today. Smith acknowledged potential obstructions to the ideal functioning of markets. Producers can try to keep secret a rise in demand, thus avoiding competition. Lack of widespread information about prices and the availability of goods is an inherent problem. Similarly, anyone with a monopoly can keep the market understocked or prices too high. A tariff to keep exports out keeps prices too high to satisfy effectual demand. Smith did not fully explore some other problems. Simply said, he believed market participants must know what they want and what they are willing to pay. Barring such (rather formidable) obstacles, the process is automatic. Government will only hinder it with taxes, product standards, and price regulations. In his chapter on natural and market price, then, is Smith’s almost complete description of the Invisible Hand. So accepted and seemingly obvious is his theory that it is hard to believe that Smith did not conceive of the supply and demand curves that all first-year economics students learn. Alfred Marshall, the talented British economist, drew these about a century later. In addition to the problems just cited, there is another major gap in the explanation of how the Invisible Hand functions. The main claim is that price sends a message to buyers and sellers on how they can adjust their consumption and production. But the countless buyers and sellers must communicate with each other, after all—in effect, bargain. This is no easy task. Smith’s proposal that there is a natural price for a product is sketchy, to say the least. There is no convincing explanation of where this natural price comes from. Smith presumed that there exists for goods and services a price known by custom and practice and that the price goes down and more people buy as new and cheaper supply comes on the market. Within this set of narrow possibilities, the Invisible Hand can spread the benefits of productivity and induce businesses to invest more, expand capacity, increase production, and reduce labor costs. They may also hire more workers and even raise wages. A bookseller, for example, might sell a book for $19.95 and see how many takers he gets, thus testing the market. But what if a $14.99 price would attract many more buyers, resulting in a greater total profit for the bookseller? A competitor might then sell a similar book as cheaply, and so the experimentation that led to an equilibrium price would continue. Léon Walras, the influential French economist who in the late 1800s used mathematics to expand the Invisible Hand as a model for the entire economy, did not have an answer to how the process would work in real life, either. Walras presumed that there was an economy-wide “auctioneer” who gathered all prices of goods and sold them to those willing to pay. That assumption about the process by which the Invisible Hand matches buyers and sellers has not been improved upon by contemporary economists. How the equilibrium point is reached remains a mystery. This central ambiguity matters a lot. Prices can in fact be shoved around by powerful forces: big business, strong unions, and ubiquitous monopolies, or at least oligopolies with market power. In financial markets, prices can be manipulated by collusion or secret trading or access to inside information. In labor markets, wages can be affected by the ability of businesses to fire workers without cause or by stern government policies that restrain growth and keep unemployment high. Belief in the Invisible Hand allows economists to minimize these concerns. The battle against unions, for example, is driven by a claim that the Invisible Hand guides business and labor to set fair wages. Union organizers believe that they are not set fairly and that workers need collective bargaining to level the playing field. Alan Greenspan, as Federal Reserve chairman, believed that bargaining power mattered. High unemployment, he realized, could keep workers insecure and therefore less willing to bargain hard for their jobs, giving business more power over wages than the Invisible Hand would dictate. One measure of insecurity is the rate at which workers are willing to quit their jobs. If the quit rate is high, workers are secure and might ask for higher wages, putting pressure on business to raise prices and stimulating inflation; if the quit rate is low, workers don’t have the security to bargain hard. (Of course, unions sometimes have too much power, too, driving wages too high.) Greenspan kept a close eye on this and seemed to encourage worker insecurity. Faith in the Invisible Hand led to the once-general belief that a higher minimum wage results in lost jobs. It presumes that the wage paid reflects the worth of the workers and that any wage increase resulting from a minimum wage law represents an overpayment to workers, reduces profits, and also reduces the hiring of new workers. But in fact often the wage can be too low because of a business’s power or generally restrictive government policies that keep unemployment high. In that case, a hike in the minimum wage would be healthy economically, restoring demand for goods and services, and would not cause jobs to be lost. At the turn of the nineteenth century, the American economist John Bates Clark made one of the first claims that, economy-wide, wages reflect the worth of labor. As we shall see, there is little serious empirical work to justify this conclusion, and recent studies—what I call dirty economics—have shown that increases in the minimum wage result in very few lost jobs, if any. Empirical analysis is at last changing economists’ minds. Another concern regarding the labor and other markets is often referred to as asymmetric information. The classic example is the used-car salesman who has more information about the car than the buyer has, much of which is kept secret. As Smith feared, a market cannot work under these circumstances. Buyers cannot make proper bids without knowing what they are buying. This concern extends to markets in health care, insurance, and mortgages—and arguably to most other markets as well. It is not only the poor subprime mortgage buyer, for example, who will make errors, but almost all homebuyers who enter into such transactions only two or three times in their lives. How can they possibly be knowledgeable and informed? Even sophisticated pension fund managers clearly did not have enough information about the complex mortgage securities fashioned by Wall Street to make sensible decisions in the years leading up to the 2008 crisis. Countless pension funds and individual investors and the Department of Justice have been suing major banks like JPMorgan Chase and Goldman Sachs over alleged deceptive practices, and in several cases multibillion-dollar settlements have been reached. One Goldman Sachs banker—if only one—has gone to jail for selling the complex products without informing his buyers. A pure interpretation of the Invisible Hand suggests such easy fraudulent behavior should not be possible. The Invisible Hand also depends on market participants knowing and understanding their self-interest well and therefore making rational decisions about buying and selling products. Behavioral economics has uncovered many examples of buyers being unable to make such rational decisions, a factor economists once minimized. An obvious example is herd behavior in buying stocks, in which buyers are lured into paying high prices because so many others are. The opposite, also damaging, is irrational risk aversion, with investors refusing to buy even when the odds of gains are good. Another example is susceptibility to misleading advertising. Still another is fashion itself, evident in surges in demand for new products like the iPhone or traditional ones like an Hermès Birkin bag. One can argue that there is some satisfaction in being a part of fashion, of course, but not if it leads to buying bad products or stocks whose prices will inevitably fall precipitously. The seeming power of the Invisible Hand, however, enables many economists to neglect or set aside these concerns. Milton Friedman forcefully argued that competition will correct most wrongs. Fraudulent products or manipulated financial services will create opportunities for honest competitors, overpricing will create opportunities for sellers to reduce prices, and herd behavior leading to overspeculation will be counteracted by sellers who know better. There is no need for labor unions to offset the power of business, as John Kenneth Galbraith had claimed in his concept of “countervailing power”; unions will only keep wages too high by interfering with the Invisible Hand. The Invisible Hand is a source of clean economics in a dirty world. Great castles can be built on the Invisible Hand, but a rising tide will wash them away. This is what happened in 2008. Among the most important limitations of the Invisible Hand are economies of scale. The Invisible Hand presumes that it will eventually cost more to produce a good, not less. The supply curve rises to meet the demand curve. But the greatest productivity increases in the Industrial Revolution were arrived at as the volume of sales increased; this is what enabled Henry Ford and others to cut prices. The more you make, the lower the unit cost. The supply curve could actually fall when more units were demanded at lower prices, and it often did. Economies of scale are a major component of wealth creation and of the history of economies. Smith’s pin factory was a version of this. The grandest leap of faith among economists, however, concerns more than how the Invisible Hand works in a single market. A general equilibrium was reached for all markets and the economy as a whole. This conclusion, arrived at by economists like Léon Walras, is remarkably convenient, but the assumptions required to make such a claim are extreme. The many obstacles to the workings of the Invisible Hand amount to an overwhelming criticism. The Invisible Hand is an approximation, usually not applicable in the real world without significant modification. Dependence on it leads to major policy errors, most of them having to do with restraining government intervention. We assume away monopolies, business power, lack of access to information, the likelihood of financial bubbles, economies of scale. The proof is in the pudding. Predictions about economies based on this generalized theory have often been proved wrong. The most important of these is that economies should be stable because they self-adjust to reach general equilibrium. Yet we have had countless deep recessions and financial bubbles and crashes since the start of the Industrial Revolution. The eighteenth century was rife with them, but so have been the past thirty years of the modern laissez-faire era. Simplistic, convenient belief in the Invisible Hand led to mindless financial deregulation beginning in the 1970s and an astonishingly misplaced faith—one that ignored asset bubbles and income inequality, among other things—that the Great Moderation would maximize prosperity. This is why the devout believer Milton Friedman could state in 2005 that the economy was stable; he couldn’t imagine that it wasn’t, and he never looked under the hood of Wall Street securities to see what was really going on. If rightly read, Smith’s theory proposes the opposite of laissez-faire political practice, suggesting that there is a need for a visible hand of government. It describes both why markets work and why they fail, as well as how much guidance from an outside force is needed to keep them on track. The Invisible Hand is a brilliant idealization of markets that shows how limited laissez-faire theory is in reality. 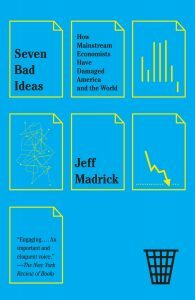 From the Book: SEVEN BAD IDEAS by Jeff Madrick Copyright © 2014 by Jeff Madrick Published by arrangement with Vintage Books, an imprint of The Knopf Doubleday Publishing Group, a division of Penguin Random House LLC.